Tucked away in a quiet block not too far from the hustle and bustle of Harvard Square, L.A. Burdick Handmade Chocolates is a chocoholic’s dream. The moment you take your first step into the store, you will be enveloped by the store’s warm and ambient atmosphere. With pink and gold wallpaper and wood furniture, the store allows its customers to take a breather and relax. Upon walking to the counter, you’ll be greeted by a display of gorgeous desserts. From Earl Grey Brioches to chocolate cakes, there are enough desserts to satisfy even the pickiest eater. Packed in this triangular dessert is a flavor bomb of chocolate and passion fruit. Upon first bite, the chocolate exterior melts in your mouth, laying out the red carpet for the passion fruit and raspberry to step in and add a refreshing, tangy taste. With such a power combo, the cake is not too sweet which makes it a great pairing with a cup of steaming hot chocolate. A twist on the classic French pastry, the raspberry chocolate croissant had an interesting taste. The croissant was wrapped in bands of chocolate and had a raspberry jam filling. The exterior was flaky and soft but did not meld well with the raspberry jam which was cold and clumped together. But even with the wide array of desserts, the true star of this chocolate dream is the Classic Milk Hot Chocolate. The amount of flavors and textures packed into a single cup of this chocolate ambrosia cannot fit into a single word. The texture was well balanced and not too rich as some hot chocolates can be. Surprisingly, the level of sweetness wasn’t through the roof. Instead, it was mild and made it a perfect drink to sip slowly while staring out the window. For the adventurous ones, there is the Spicy Dark Hot Chocolate. With hints of spice here there and a devilishly rich texture, the drink can take a long time to finish. In between sips, it can be paired with bites of the passion fruit mousse. With such a variety of sweets and drinks, L.A. Burdick’s has something for each and every one of its visitors. 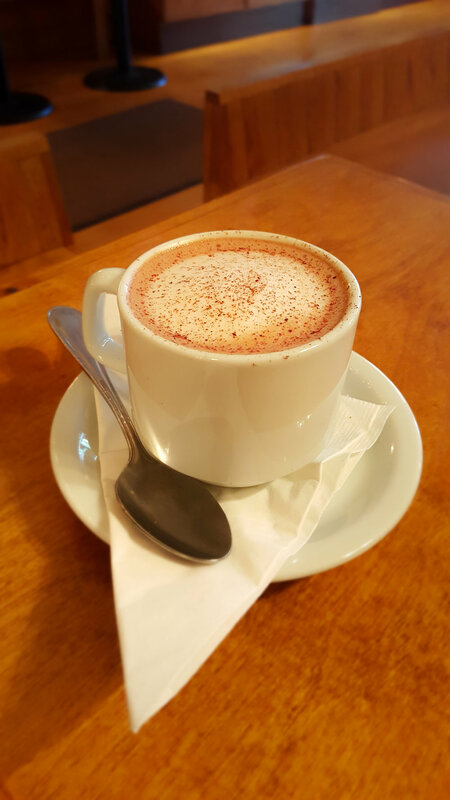 So, next time you’re in the mood to take a break from school and take it easy, consider visiting L.A. Burdick for a nice, steaming hot cup of hot chocolate!